AT&T has started sending out press invites for an event that will be held on July 16th. Unfortunately, AT&T doesn't give much as far as clues that would help us guess what the event could be about. 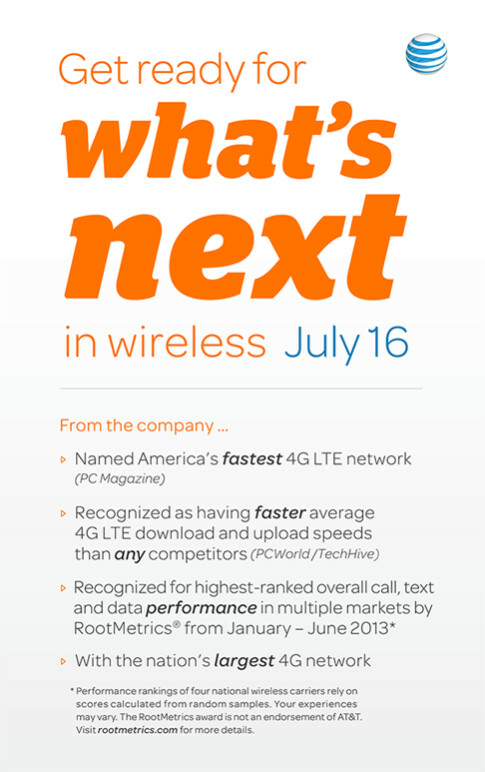 The tag line for the event is "Get ready for what's next in wireless", and the invite goes on to give a few reasons why AT&T's LTE network is all sorts of great (to paraphrase the literature). While we don't know what the announcement might be, the only devices on the horizon for AT&T are the Nokia Lumia 1020 and the HTC One mini; so, it's possible we'll see the Lumia announced. Otherwise, we would expect more info on the buildout of the LTE network. We'll be sure to keep you posted with whatever the announcements are. Are they really going to give Nokia a sh!t ton of press? Lets hope so! Maybe LTE-A in limited rollout with the S4 LTE-A...? Eos eos eos eos.....I'm thinking at&t gonna announce EOS for sure.....!!! 1 & half days to go....can't wait. Woohoo so excited. Think it's gonna be thier pre-paid service AIO going national. That might be part of it, but I think it's going to be more than that. I don't see AT&T making a big deal about AIO when their post-paid business is as big as it is. New phones, AIO, and perhaps a sneak peek of LTE-A?